It took D-Link longer than they probably wanted to squeeze out its first AC1900 router, the DIR-880L. Perhaps it was angst over abandoning the upright cylinder format adopted for just about all its other AC class routers. Nevertheless, it's out, it's flat, so let's take a look. 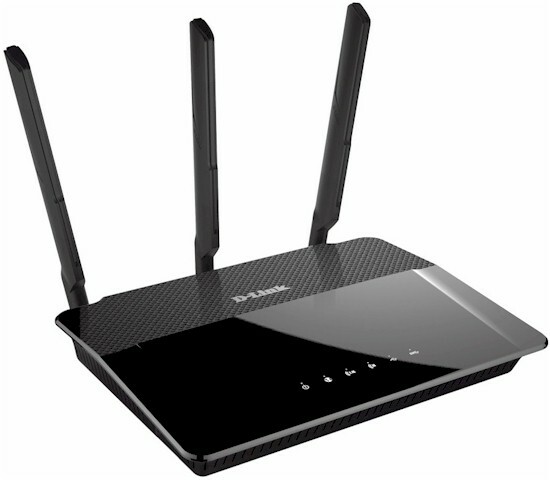 The DIR-880L does indeed look like most other AC1900 routers, with three designed-to-impress large dual-band dipole antennas arrayed across its rear panel, joined via RP-SMA connectors. The 880L's data sheet says these are "high-gain" antennas, but omits actual gain numbers. The callout diagram below shows the 880L has both USB 2.0 and USB 3.0 ports, just like NETGEAR's R7000 Nighthawk, ASUS' RT-AC68U and Linksys' EA6900. All lights are on the top panel and most connectors are on the rear. Note none of the gigabit Ethernet ports have link or activity lights, so you need to log into the admin interface to see if stuff is actually connected. The USB 3.0 port is awkwardly stuck on the left side and the WPS button, which bears no marking identifying it, sits in about the same position on the right side panel. At least D-Link didn't hide the USB 3.0 port under a gawd-awful tethered rubber plug as ASUS did on the RT-AC87. On a more positive note, there are mounting screw slots centered on the bottom side that allow you to decide whether ports and antennas point up or down when wall mounting. You would think given its timing and pricing that the 880L would have a latest-and-greatest design. But you may be disappointed to learn that it uses the older Broadcom BCM4708A SoC as its main processor vs. the newer and more powerful BCM4709A. D-Link also cheaped out on memory, too, providing only 128 MB of RAM and 16 MB of flash. At least they tried to do a decent job of heat-sinking, as evidenced by the big plate in the internal FCC photo below. Removing the heatsink plate and RF can lids lays bare the 880L's design, which alternates 2.4 and 5 GHz amplifiers to keep path distances to each antenna connector short. That's the USB 3.0 port at the photo left front, wisely placed far away from the radios and shielded both top and bottom of the board, to eliminate causing problems with 2.4 GHz radio performance. Table 1 shows the key components for the 880L and its AC1900 competition.